【Ingredients】 bile acid, mother of pearl, hyodeoxycholic acid, gardenia, buffalo horn, Radix, baicalin, honeysuckle. Accessories for the sucrose. 【Properties】 This product is yellow-brown granules; sweet, slightly bitter. 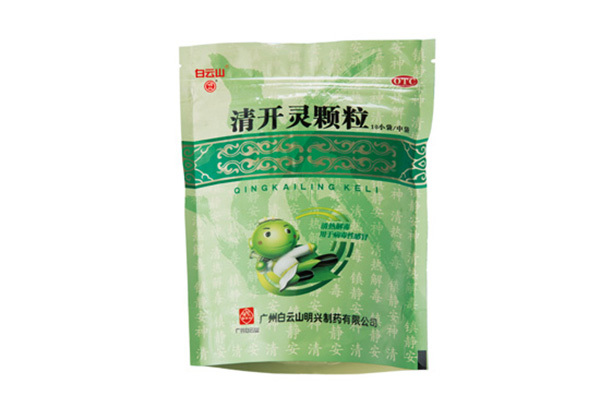 【Indications】 Qingrejiedu, calm and soothe the nerves. For exogenous wind-induced fever, irritability, sore throat; and upper respiratory tract infection, viral influenza, acute pharyngitis see the above syndromes. Dosage orally, a 1 to 2 bags, 2 to 3 times a day. Taboo Pregnant women disabled; patients with diabetes forbidden clothes. 【Packing】 composite membrane bag. 10 grams per sachet, 10 sachets per bag.